Coming into the 2017 Minor League season, all Jon Duplantier wanted to do was finish. The right-hander had heard grumblings about the inability of pitchers from Rice University to stay healthy, and he didn't want to become the latest example. Having dealt with several injuries already in his single professional season, the noise had only grown louder. "The people that talk negatively about it always forget to leave out the guys who have the success," Duplantier said. "Even when I first committed and signed to Rice, people instantly were in my ear about it. It's something you can't distance yourself from, no matter how hard you try." The D-backs' No. 2 prospect did finish. Not only that, he led all Minor League starters with a 1.39 ERA, dominated the hitter-friendly California League, was named Arizona's Minor League Pitcher of the Year and now takes home the 2017 MiLBY award as Top Starting Pitcher. "It's a great honor," Duplantier said of all the accolades. "There are a lot of studs playing professional baseball. It feels like at least once a week you're watching a game where you see a highlight or something on Twitter and it's just unbelievable stuff. Guys are doing great stuff all around the league." Duplantier's rise can be traced all the way back to Spring Training. The 2016 third-round pick entered as a relative unknown, having missed all but a single inning of his debut season due to elbow and hamstring issues. It didn't take long for him to begin to stand out, however. After two hit-or-miss bullpen sessions, everything suddenly started to click. "The third one it was like, 'Ah, ok,'" Duplantier said. "When you get four [sessions] in and your command is starting to look up, it's a confidence boost, and that kind of added fuel to the fire." "You could see right there that there was something about him," said Rich Sauveur, the pitching coach for Class A Kane County. "I was hoping I would have a chance to work with him." Sauveur got his chance when the D-backs assigned Duplantier to the Cougars to begin the year. Even he couldn't have predicted the dominant run the 23-year-old hurler was about to go on. Duplantier held Clinton to one hit over five scoreless innings in his Midwest League debut on April 7. It took until May 2 for him to surrender his first earned run as he yielded three over five innings against South Bend. Over his first 10 starts with Kane County, he gave up five runs -- three of them earned -- and 25 hits in 54 1/3 frames. "He stepped up to the plate," Sauveur said. "He came in his first outing and threw the ball very well and did so all the way through the end." "It was fun, especially because on our team we had some young guys and some pretty unique characters," Duplantier said. "There were a lot of different remarks and jokes that were getting thrown at me." 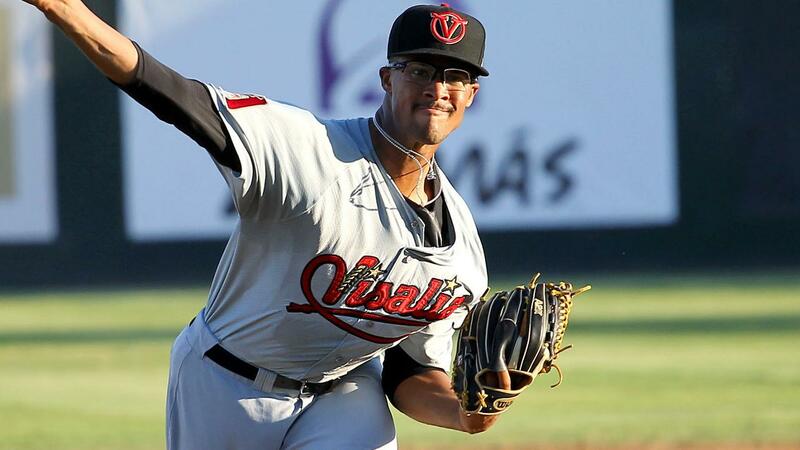 Three starts later, Duplantier received his first-ever in-season promotion, to Class A Advanced Visalia. He departed the Midwest League with a 6-1 record, a 1.24 ERA that led the circuit at the time, 15 walks and 78 strikeouts over 72 2/3 innings. The California League awaited the Delaware native, a circuit known to cause difficulties for many young pitchers. Of the league's eight teams this past season, seven posted an OPS above .700 while five belted more than 110 home runs. "You watch BP the first day and you're just like, 'What did I get myself into?'" Duplantier said. "Your mind-set can go a lot of different ways. But the pitching coaches there did a pretty good job of reminding me that if you execute your pitches you'll be fine. The ball goes a little bit farther, but it only goes farther if you leave it over the middle of the plate." For the first time all season, Duplantier struggled to find the plate in his debut with the Rawhide on June 25, issuing five walks while giving up a pair of runs on three hits and fanning five over 2 2/3 innings against San Jose. Though he was frustrated, he knew he couldn't afford to dwell on a rough first impression. "We're going through loop-de-loops on the roller coaster and having a good time, and now I was on the opposite end," Duplantier said. "It wasn't a great low. I'm going to have lower points in my career than that, but getting myself out of the dumps quickly [was important]." The 6-foot-4, 225-pounder quickly found his comfort zone as he allowed two runs and just seven hits in 12 innings over his next two starts. He soon caught fire, yielding six runs over 43 innings and racking up 63 punchouts over his final eight outings of the season. "Once he got acclimated, he was fine, and I knew he would be," Visalia pitching coach Jeff Bajenaru said. "He just had to take that deep breath, move on and get back to what he had been doing all year. "I knew he took care of business just by the way he went about his work on the side, his bullpens and stuff like that, the way he worked in the weight room. Immediately, you could tell he was just a competitor." At both levels combined, Duplantier finished the season 12-3 with a 1.39 ERA, 42 walks, 165 strikeouts and a .192 opponents' batting average over 136 frames. He vaulted from No. 12 to No. 2 on MLB.com's ranking of D-backs prospects while entering the Top 100 at No. 95 overall. "He's a typical Major Leaguer, there's no doubt about it," Sauveur said. "You've got to have fun in this game to succeed and this kid does it, and when he steps between those lines it's a different game [for him]." Having accomplished his goal of making it through the season, Duplantier said he wasn't sure what his goal would be for next year. However, the bar will undoubtedly be raised. "I'm not ever going to really set goals for myself that are results-based, but I'm going to set goals for myself in terms of things I can control," he said. "The main goal next year is kind of vague -- just continue and try and get better. I want to have better fastball command, I want to pitch more with the fastball and stay healthy. "Basically, do the same thing all over again."